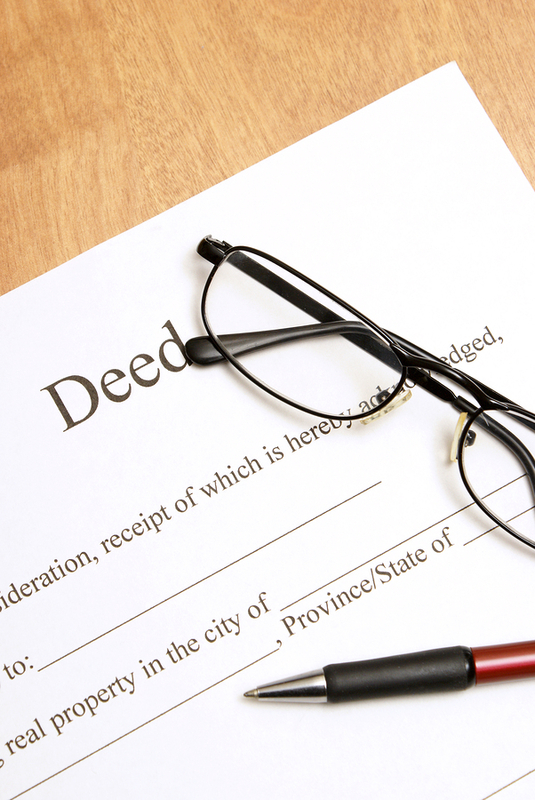 In Massachusetts there are three types of deeds that are used for the purposes of real estate transactions: warranty deeds, quitclaim deeds and release deeds. Each type of deed offers varying levels of protection and guarantees against flaws in the title of the real estate being transferred. The vast majority of property in Massachusetts is transferred via a quitclaim deed. Home buyers typically receive the same type of deed from a seller that the seller received when purchasing the property. Warranty deeds. In Massachusetts a warranty deed generally offers the greatest amount of protection to someone who is purchasing or receiving the title to a piece of real estate (the grantee). A warranty deed includes four basic assurances to the grantee at the time of transaction. The first warranty is that the current owner and seller of the title (the grantor) does in fact own the real estate in fee simple, which assures the grantor has absolute ownership of the property. Second, a warranty deed guarantees that the property is free from any encumbrances (anything that affects or limits the title of the property such as easements or liens) except for those specifically stated in the deed. Third, the warranty deed guarantees that the grantor of the title has the legal right to sell or transfer the property to grantee. Lastly, through the deed, the grantor promises to defend against any legal claims regarding problems with the title that arose not only during the grantor’s ownership period but also prior to that period time. Quitclaim deeds. Quitclaim deeds differ from warranty deeds in Massachusetts in that the assurances are more limited. The first assurance a quitclaim deed makes is similar to the second guarantee of the warranty deed, which states that the grantor of the title has not made any encumbrances on the property other than those specifically mentioned in the deed. Unlike a warranty deed, however, the quitclaim only covers encumbrances made by the grantor and does not cover any preexisting encumbrances such as easements or restrictions set forth by the municipality. In addition to the first assurance, the quitclaim deed guarantees that the grantor will defend against any legal claims regarding problems with the title that arose during the grantor’s ownership period but not prior to the grantor’s ownership. Essentially a quitclaim provides the same protections as a warranty deed except it limits how far back in time the grantor is liable for any problems resulting from the title. Release deeds. The third type of deed used in Massachusetts, the release deed, offers the least amount of protection for real estate transactions. A release deed does not guarantee anything and merely serves to transfer a title or whatever right the grantor holds to a specific property. With a release deed the grantor does not need to assure that the title is valid; thus, it ultimately provides no assurances whatsoever. The information on this Web site is not legal advice, but for informational purposes only. Please read the full disclaimer and contact a licensed real estate attorney. Please also carefully review our frequently asked questions section or contact us anytime to set up a free, no-obligation consultation, so you can meet us and learn more about how we assist home buyers purchasing real estate. Call (978.835.5906) anytime to schedule an in-person meeting or read about our brokers online.